A mix between black and white, gray is gaining popularity as the new neutral. From light dove to dark charcoal, this color looks great on everything from home accents to walls. Gray is the ultimate neutral. It looks good with almost any color and ranges from cool to warm. In this bedroom a classic gray coats the walls. 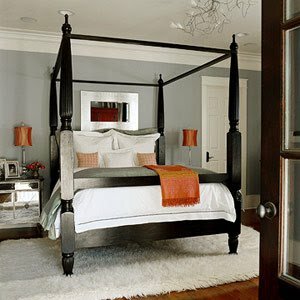 A black four-poster and cream-color shag rug complement the cool wall color. Burnt orange accents, table lamps, and throw pop in this neutral room. A mirrored nightstand and metal-framed mirror above the bed add a touch of glamour.